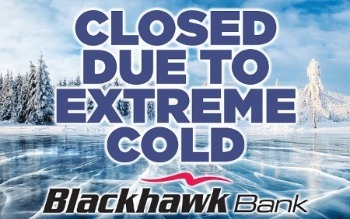 January 29, 2019 (Beloit, WI) – For the safety of our employees and clients, all Blackhawk Bank locations will be closed on Wednesday, January 30, 2019. The Bank will reopen at Noon on Thursday, January 31st. Those locations include Beloit and Janesville, WI and Rockford, Belvidere, Machesney Park, Roscoe and Elgin, IL.